Work with the nautical chart. 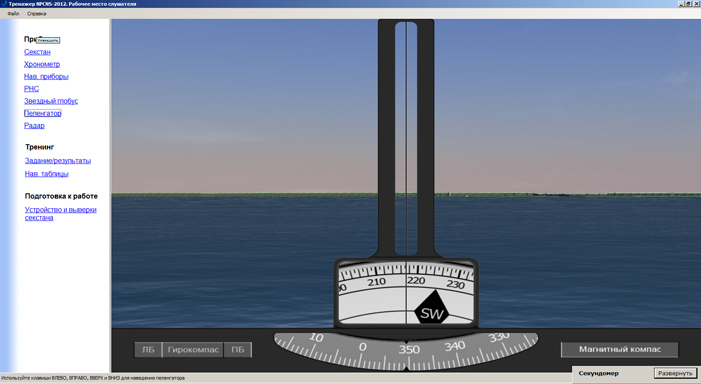 Position fixing with the use of different methods with the application of simulators of navigational equipment. Execution of preliminary route plotting and route monitoring. Conducting of main types of navigational calculations, required during the vessel is on the way. Use of astronomical instruments and teaching aids for the aims of vessel’s position fixing and heading indication system adjustment reckoning in real time mode. 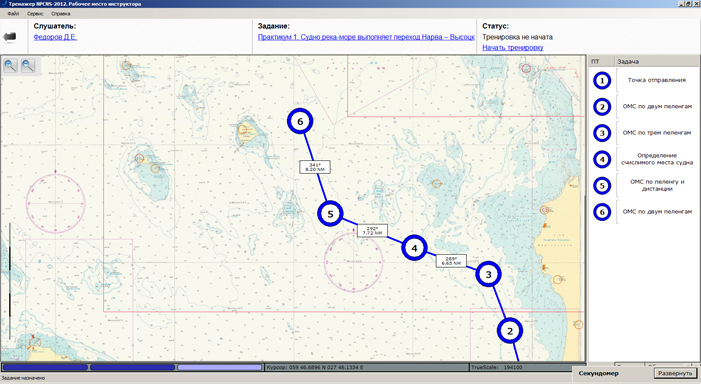 Electronic chart of the area "Ports Vysotsk and Vyborg (North-Eastern part of Gulf of Finland)"
Instructor on the Instructor WorkPlace issues to each Student WorkPlace advance made exercises, consisting of one or several navigation or astronomy tasks. For task solution each student being on its "virtual" vessel has the possibility to: observe surface picture and sky, take readings from the navigation equipment and astronomic instruments imitators, use "paper" nautical charts and astronomic tables. Results of performing calculations on each task are saved on Student WorkPlace. After performing of the full exercise results of calculations are sent to Instructor WorkPlace where automatic valuation is made. Instructor WorkPlace is intended for control of the students' training process. form and store in the register the results logs of students' practical training. Exercise editor is intended for development and storage of exercises for their future use. 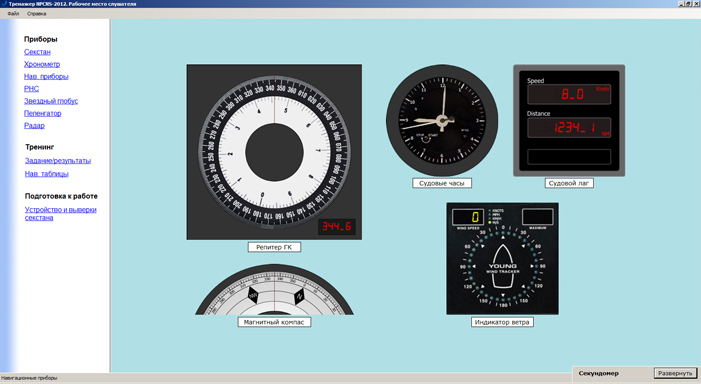 condition of navigational and astronomic devices work mode is set up. calculation of the course and arrival time to the waypoint with the known coordinates in the given moment of time. pilotage (student should go through all the given waypoints), among them in the presence of wind and current. - compass correction determination by sunrise azimuth or by celestial body bearing in selectable azimuth. electronic chart with the plotting. STCW Code, Section B-II/1 p.19 "Training in celestial navigation"